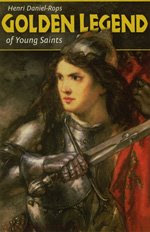 I was very excited to see that Sophia Press republished the wonderful book for children, Golden Legend of Young Saints, which was originally published in 1960, filled with stories from the childhoods of many inspiring saints! In the opening paragraph the author, Henri Daniel-Rops, explains that "The Golden Legend" was "an enormous book in which a learned priest had set down everything he could find about the saints and martyrs of the Church, everything that he thought interesting, strange, amusing sometimes, and, of course, instructive." The same can be said for the stories found in this book! Once I started reading, even though it was written for children (the reading level is appropriate for ages 9-12), it was one of those books I could hardly put down and hated to see come to an end. I loved that the book included some saints, whom I knew very little (if anything) about, as well as some stories I had not heard before of the more "well known" saints, like St. Mark. I have not read this book in its entirety to my children yet, since I think a few of the stories might frighten my little ones. I have read a few individual stories to them and they continually beg for more! I always love finding books that can capture their attention like this one has. This review was written as part of The Catholic Company reviewer program. Please visit The Catholic Company to get more information on Golden Legend of Young Saints.